Welcome to your 40s. At this point in your life, your earning power should be growing as you use your experience and expertise to reach the top of your field and embrace more senior and leadership positions. Of course, with more money comes more opportunities to spend it. You may be itching to upgrade your lifestyle, moving into a larger house, buying a sleek new car, and treating yourself to fine dining and luxury goods because you can. In this decade of life, you may also send your children to expensive private school and colleges or even have to pitch in for a wedding. Of course, upheaval can happen at any time. You may lose your job and struggle to find a new one. This might be the decade where you make the decision to divorce your spouse, or perhaps an aging parent needs more expensive care. 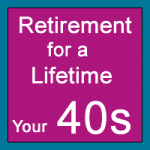 Regardless of your specific situation, you can’t slow down on your retirement saving in your 40s. In fact, it is now more important than ever to make sure you keep saving or even ramp up your saving efforts if you haven’t been putting away as much as you should have in your 20s and 30s. When it comes to saving for your retirement, time is power. Given enough time to grow, even small regular investments can add up due to the power of compound interest. If you weren’t able to save as much as you wanted in your 20s and 30s, even with two decades to go until retirement, now you have to play catch up and try to replace all the compound interest gains you lost out on. Before you start pampering yourself with that sleek new car (or maybe a pair of designer pumps), make sure you are maxing out your 401(k) contributions each month. You have enough earning power now that bumping up your contributions shouldn’t hurt your bottom line too much. If you still feel like you are behind on your retirement savings, then maxing out your 401(k) may not be enough. Consider also opening an IRA to give yourself more saving power. (Find out the differences of a Roth vs. traditional IRA). Is it Time to Re-Weight Your Allocations? Ideally, you should reallocate your retirement savings on a regular basis to make sure your investments are balanced across different risk classes. However, as you move along your retirement savings trajectory, you will want to re-weight your allocations as well. You may have allocated a significant proportion of your savings into high-risk investments in your 20s, knowing that you had plenty of time to ride out the big highs and lows. That might not be a smart plan in your 40s when your investments have less time to recover from declines in the market. Look at your portfolio and determine if it is time to lower your overall risk profile by re-weighting your allocation. Just as your personality will change over time, so will your retirement dreams. Maybe in your 20s retirement meant simply saving enough so you could cover your basic expenses. Now, in your 40s, however, you may dream of traveling the world or opening your own nonprofit organization. Your vision of retirement will affect how much you need to save and what investments you choose. Check in on your vision for retirement and determine if you need to revise your saving tactics (or your expectations!). Also, make sure you educate yourself about saving for retirement by visiting our archive of retirement articles.